This document outlines basic procedures for finding and safely abandoning unused septic systems and cesspools, and provides some safety suggestions for septic system inspectors, septic system inspections, septic pumping contractors, and home owners. When a septic tank, drywell, or cesspool is no longer to be used, either because a building is connected to a municipal sewer or because the old tank is being left in place and a new septic installed elsewhere, there are very important safety steps that should be taken. Guide to Proper Abandonment of Un-used Septic Tanks, Drywells, Etc. Septic tanks, cesspools, and drywells present serious hazards including septic cave-in's or collapses, methane gas explosion hazards, and asphyxiation hazards. Simple precautions which we describe here can help avoid a dangerous septic, cesspool, or drywell hazard. Watch out: for unsafe septic tanks and cesspools or drywells and for systems that were not properly abandoned. In 2008 Mark Cramer shared a report from an owner that that their horse fell into a septic tank and died tragically before it could be rescued. The collapsing septic tank was not in the location which the owners thought it would be found, and clearly it had an unsafe cover. We were consulted in a Long Island death of an adult who fell into and was buried in a collapsing cesspool. And in 2012 we were contacted for comment involving the death of two boys who fell into and perished in an "abandoned" septic tank or cesspool that lacked a safe cover. It is important to properly abandon un-used septic tanks, cesspools, or drywells. If an old septic tank, cesspool, or drywell is simply "left alone" there may be very serious cave-in or fall-in safety hazards. Septic tank, drywell, or cesspool abandonment or tank closure may involve complete tank removal, tank crushing (steel septic tanks), or most common with site-built tanks/cesspools/drywells, and with concrete tanks, the cover is opened and the tank is filled-in with rubble and soil. Details of septic tank, cesspool, drywell abandonment procedures are discussed in this article. If the old septic system component to be discontinued is a cesspool or drywell, and occasionally with septic tanks, the old tank might be left in place and "daisy chained" to the new one. This was common at country and farm properties that relied on a cesspool for onsite waste disposal. Owners hoped that the old system might still help a little with wastewater treatment and disposal even though it had stopped working. This approach is dangerous if the old system has an unsafe cover, is in danger of collapse, or is leaking where it should not be. are often removed, crushed, and buried back at the site, possibly below or along side a new septic tank - details are below. are often filled-in after holes are broken into the tank - details are below. are a newer item with less experience in abandonment. If such a tank is badly damaged and leaky it needs to be removed and replaced. It may be possible to crush and bury such a tank as in the case of steel tanks. To avoid the risk of a collapsing septic tank, cesspool, or drywell which is no longer used, it is important to find and properly close out such facilities at any property, residential or commercial. In the photo at the top of this page, the truck "found" an abandoned septic tank by driving over it. - a septic pumping contractor performs this step. - so that it won't hold surface runoff, forming an un-wanted water or mud reservoir. If the septic tank is steel, often the contractor will dig out the tank, crush it, and then bury it back in the original hole. When we installed a new concrete septic tank the contractor pulled out the old steel septic tank, crushed the old steel septic tank into a flat slab of rusty metal by driving his backhoe over it, dropped the new concrete septic tank into the old excavation, slipped the old flat steel septic tank on edge alongside the new concrete tank, and buried it. where the tank was located (if you crushed an old steel tank) with stone, rubble, and soil so that there is on future collapse hazard. If the old septic tank was steel and was crushed (as above), the excavation contractor may decide to clean-up the existing septic tank hole and use it to drop in the new tank in the same location - this is fine, and it simplifies plumbing connections to the new septic tank. and that a secure cover remains. Otherwise future settlement of the septic tank fill can cause sudden dangerous collapses. so that future site work or building plans can avoid or at least anticipate these buried obstructions. from septic tanks and drainfields: We've written elsewhere about the importance of keeping livestock off of septic drainfields and septic tanks. There may be an extra risk of livestock-caused septic tank collapse where old septic tank or cesspool covers or even new fiberglass septic tanks and covers are installed. When wastewater disposal systems are abandoned, a septic tank and seepage pit must have the sewage removed by a septic tank pumper, and must be crushed in place or completely filled with compacted soil, concrete, or other approved material, as required by the Uniform Plumbing Code. Continue reading at SEPTIC & CESSPOOL SAFETY or select a topic from closely-related articles below, or see our complete INDEX to RELATED ARTICLES below. 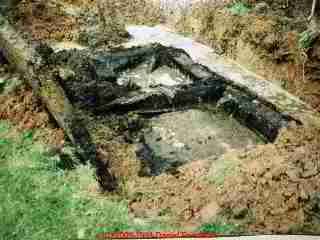 SEPTIC TANK ABANDONMENT GUIDE at InspectApedia.com - online encyclopedia of building & environmental inspection, testing, diagnosis, repair, & problem prevention advice.